Coins marking the Commonwealth Games in Glasgow and the 100th anniversary of the start of World War One will enter circulation in 2014. 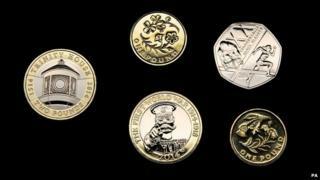 The Royal Mint has released details of the new coin designs that will feature on the 50p, £1 and £2 coins. The new coins will enter circulation gradually, so people will start to spot them in their change during the year. Five billion coins are produced at the Mint's site in Llantrisant, south Wales, every year. The regular designs currently found on UK coins will continue to be used, but some will be replaced with the new designs as they become unfit for use. The new design of the £2 coin will feature the image of Lord Kitchener's call to arms. This is the first Royal Mint coin of a series that will mark WW1 from its outbreak to the armistice. Another new design for the £2 coin pays tribute to the 500th anniversary of Trinity House, the coastal defences that have helped protect shipping since 1514. The new designs for £1 coins will continue a series celebrating the floral emblems of the nations. The shamrock and flax plant feature on the £1 of Northern Ireland, while the thistle and bluebell are portrayed on the Scottish £1 coin. The success of coins marking the London 2012 Olympics has prompted the Mint to produce a coin to mark the Commonwealth Games in 2014 in Glasgow. The 50p coin will feature two sports - athletics and cycling - as well as the Saltire of Scotland. Shane Bissett, director of commemorative coins at The Royal Mint, said: "The Royal Mint has celebrated moments of national and cultural significance for more than 1,000 years. "We wanted to reveal the coins to the British public and show the incredible works of art they can expect to see enter circulation this year. This will no doubt entice many to take a closer look at their change, collect their favourites and realise that many might be worth holding on to."